Chamomile is an anti-inflammatory and antiseptic flower that’s also hypoallergenic. It has the ability to neutralize many substances that irritate the skin and it’s shown effective in treating eczema in clinical trials. Chamomile has been studied in several trials for its potential as an powerful ingredient for use in healing skincare. One study documented in Germany shows that chamomile was 60% as active as .25% hydrocortisone when used topically on eczema patients. Chickweed is a pretty uncommon herb, but its been used for healing in Chinese medicine for hundreds of years. Today, many herbalists recommend chickweed as an anti-inflammatory and anti-viral medicine. This flower contains polysaccharides that work to heal and soothe irritated skin naturally. Calendula is a flower that’s been used for generations to treat a variety of skin conditions. It’s an herb that has anti-inflammatory properties, which is exactly what someone suffering from eczema needs. 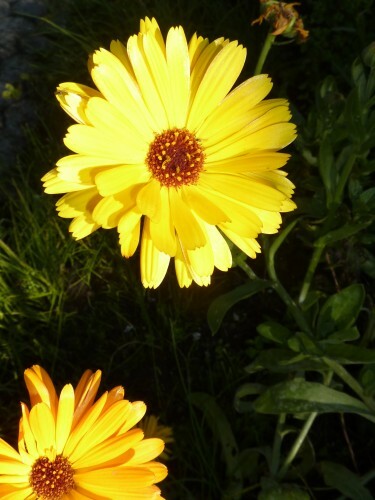 Calendula also eliminates bacteria and helps heal any skin lesions associated with eczema. Since eczema is characterized by a chronic inflammation of the skin, it makes sense that a person looking for a gentle anti-inflammatory treatment would turn to the flowers that we’ve mentioned. If you’ve had experience using flowers to treat eczema, feel free to drop us a note below. We’d love to hear about your experience and about which flowers helped clear up your condition. Did you know that if you suffer with eczema, you can turn to flowers for healing? The following are some flowers that you can use to make soothing ointments, masques, and bath soaks to help relieve the discomfort associated with eczema.To use these flowers as an ointment, cut them into small pieces and then crush them, then mix them with a pure plant oil like almond oil or coconut oil. Apply your ointment and let it sit on the skin for as long as you can. Just pick the flower petals off when you feel like it. Flower masques are made like ointments and they work pretty much like ointments, but you can use larger flowers in a masque (and lots of them) and leave them plastered to your itchy skin for about 30 minutes. Then, you’ll want to rinse your masque off. Sometimes, soaking in a warm bath with the following flower petals inside can be what’s needed to soothe red and sore skin.